The best thing you can do for your teeth is to maintain a healthy, at-home oral routine. You can do this by brushing and flossing daily, limiting sugary and acidic foods and beverages, and protecting your teeth from serious trauma. But, there are some things you just can’t do yourself. A professional clean achieves a hygienic clean for your teeth and gums that you can’t do with a toothbrush and floss. What is a Professional Clean? During the procedure, the hygienist/therapist will first examine your mouth to see if there are any issues. After the initial check, the hygienist/therapist will use a series of specialised tools (such as a scaler) to remove anything that was left behind by your at-home regime. What Does a Scale and Clean Remove? The most important things removed by a professional clean are plaque and tartar. Plaque and tartar cannot be removed by regular flossing and brushing, and if allowed to remain on the teeth can cause severe damage. Plaque and tartar attract bacteria that cause tooth decay and periodontal disease. They also contribute to advanced stages of gum disease which is incredibly difficult to treat and can cause large-scale bone and tooth loss. After the scale and clean has been completed, a mist is applied which removes any leftover debris and food scraps, which can also contribute to decay and gum disease. The dental hygienist will use a scaler. The scaler sprays water over the teeth while vibrating and scrubbing. This process breaks down the barrier around the gum, thereby enabling the tool to remove the plaque and tartar that has formed. After each tooth has been cleaned, the teeth are manually checked before they are flossed and polished. The teeth are then strengthened with fluoride. The process is entirely painless and only takes about 45 minutes. Your teeth will feel cleaner than ever before. A numbing cream can also be applied if you feel any sensitivity during the process. How Do I Know a Professional Clean? A scale and clean should be part of your bi-yearly dental visit. By visiting the dentist every six months, your dentist will be able to identify any small problems and treat them before they become more significant. 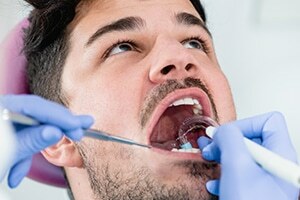 People that visit the dentist on a regular basis reduce their chance of needing any major operations or treatments by avoiding serious diseases and issues. A professional scale and clean is a key part of preventing these large-scale problems. In fact, if you feel any discomfort, you should visit your dentist for a scale and clean because many problems can dissipate after the debris and tartar have been removed. A scale and clean isn’t just important for detecting decay, plaque and tartar. It is also a valuable diagnostic tool for identifying a number of other serious conditions including oral cancer, as well any issues related to biting, swallowing, grinding and chewing. A professional clean is also a chance to review your at-home dental hygiene routine. Just by looking at your teeth, a hygienist will be able to tell if you are flossing, or if your diet or lifestyle is affecting your teeth. For example, nicotine deposits on your teeth or poor gum health could be the prompt you need to quit smoking or cut back on your alcohol intake. An essential aspect of a dental hygiene appointment is the chance to be educated and to gain some good habits that can be taken home. As mentioned, the state of your teeth is a window into how well you are looking after your oral health. You may think you are looking after your teeth by flossing and brushing every day, but the way you clean could be damaging your teeth. Brushing too hard can wear away enamel and cause receding gums, which invites decay and gum disease. Brushing too softly will allow plaque to settle on your teeth and turn into tartar. Your hygienist will be able to suggest changes to your technique and even your toothbrush. These few small tweaks can make a huge difference in your future oral health. A professional clean will have a massive impact on both your oral health and overall health. By visiting your dentist every six months for a scale and clean, you can prevent and address a range of minor problems, which will save you from the painful and costly interventions that are required for severe issues.